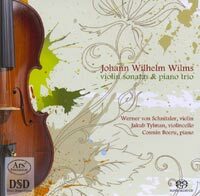 JOHANN WILHELM WILMS (1772-1847): Sonatas for Piano and Violin in E, Op. 11 & in B, Op. 29, Piano Trio in D.